Did I tell you my hair has been falling out for weeks and weeks? Like, for reals. First, the doc thought I had a scalp infection, but the prescription strength shampoo didn’t clear it up. Now she thinks it might be psoriasis, the autoimmune condition. While I wait for an appt with a specialist, I’m using a prescribed steroid cream on my scalp and trying to modify my diet. I’m making appts with all of my natural healers, too. Why am I telling you all of this? Because it’s all I can do to hide inside a big hat every day. Enter the Wear Your Joy project. I’ve been upping my game lately so that I can ride this scalp thing out while still feeling bright, and full of energy. I’m hoping – I’m certain, rather – good energy is a healer of cells. Also, tights. Lately, I have replaced jeans with tights and I’m loving the switch. Have any favorite tight sources? I’d love to know. Have any psoriasis tips? Would love to know those, too! 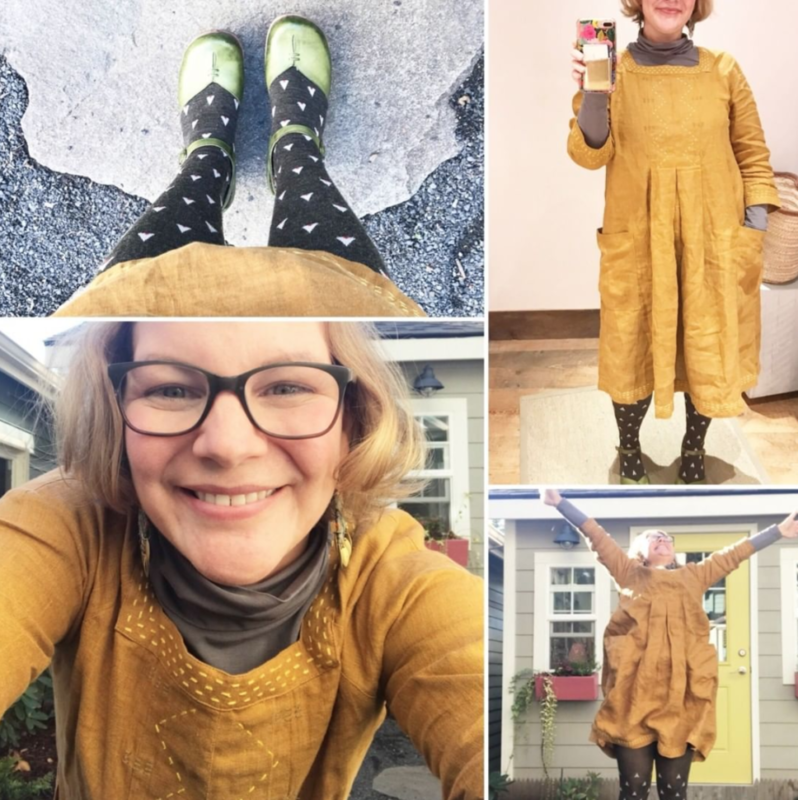 My dress and turtleneck are from Gudrun Sjoden. Have you seen their latest catalog? Inspiration overload. Shoes are Jafa and tights are old. “Actiiv”…..can purchase from beauty supply store . Stress and hormones plated a part in my friends hair loss. Yep…I’ve too have been working with Psoriasis…and Hashimoto’s Thyroiditis for years…merrily dancing in and out of “autoimmune flares” as they call them. And you should know too that autoimmune issues/diseases tend to run in clusters. If you have one immune system issue, then you may have others as well. Be sure to have your thyroid checked out for TPO antibodies, the standard lab marker for Hashimoto’s. You can have abstatootly normal thyroid TSH and T3 and T4 labs…and still be hypothyroid at the cellular level because of the antibodies to thyroxide peroxidase,. And yes, hair loss and weight gain and a lowered metabolism also go along with Hashimotos. As to Psoriasis…wikipedia actually has a fine article on the disease, treatments etc. : https://en.wikipedia.org/wiki/Psoriasis. It’s a good starting place to begin researching the possibilities. Above all…LOVE! LOVE! LOVE! your immune system. In the case of autoimmune diseases…It’s not broken…or “sick”. On the contrary, it’s acting up because something in your inner or outer environment…is triggering it to come into action to do exactly what it was meant to do…to protect you and your body from something either pathogenic or out of balance. Find what your triggers are…be they diet..viral infections or exposure to exotoxins to name a few. And be very cautious about using steroids to suppress the immune system, as they come with significant and long term side effects for your body. Yes, steroids can get your symptoms under control…but they also come at a great cost to your body systems as a whole. Instead, find the triggers…and address them…and your immune system can then quiet and calm…and you can return to being the gloriously healthy animal that you were born to be. And above all…KEEP DANCING ! ! ! Oh my goodness, I’m so sorry about your hair. I had serious adrenal problems and one of the effects was hair loss. Now, 3 years later, I’m doing much better. So have your adrenals checked. I went to a Naturopath after going to other doctors, and he was the only one to discover my adrenal problem. Good luck! Love ya. Yes, I too have struggled with adrenal fatigue and stay pretty on top of it, but definitely going to get them checked again with my naturopath. What a journey. Thank you for your support! Thank you for the encouragement, HOlly.